Center City business owners are dealing with damage from Tuesday morning's water main break. The damage comes during a crucial time for many small businesses. UPDATE: The Philadelphia Water Department says it could take months to fix the crater left behind by the water main break. 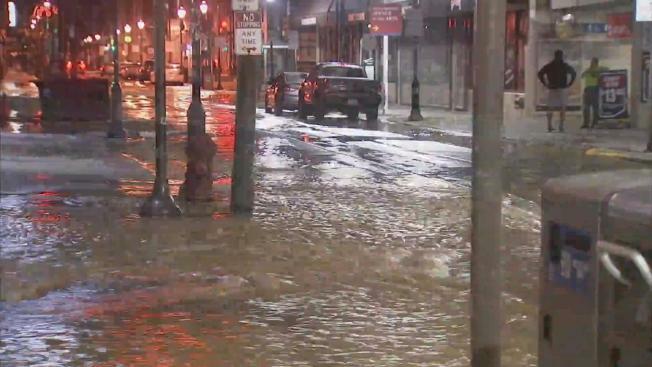 A large water main broke early Tuesday sending millions of gallons of water onto Center City Philadelphia streets and causing traffic, power and water problems throughout Center City and beyond. The 48-inch main broke around Sansom and Juniper streets around 4 a.m., leaving Juniper Street buckled toward Walnut Street. The worst of the flooding seemed to center around Walnut and Juniper streets but spread several blocks in each direction. More than two hours later, water continued to pour onto Walnut from 9th to Broad streets. Other streets in the area remained impassible as 14 to 15 million gallons of water poured out from the ground, officials said. Man Shot With Stun Gun in Viral Video Sues Police in Pa.
SEPTA detoured its route 9, 12, 21, 23, 42 and 45 buses. As of 7:45 a.m., the following streets were closed: Sansom Street from Broad to 12th streets and Juniper, 12th and 13th streets from Locust to Chestnut. There were reports of low water pressure throughout Center City and into South Philadelphia, Graduate Hospital and Bella Vista. Low water pressure affected some buildings at nearby Thomas Jefferson University Hospital, spokeswoman Jessica Lopez said. All patients were safe and water was delivered to people within the hospital. More than 1,000 customers were without power at one point and by mid-morning hundreds were still in the dark, PECO said. There are residences and businesses in the area that were without air conditioning as temps pushed into the mid 90s Tuesday. The Philadelphia Water Department said it finally got the water shut off around 7:40 a.m. Water, however, began to recede about an hour earlier, leaving a muddy mess on streets and sidewalks. The rising water stopped about an inch from the front door of historic McGillin’s Old Ale House on nearby Drury Street, owner Christopher Mullins said. Mullins noted that other business owners in the area weren’t as lucky. Sansom Street will remained "closed until further notice," Philadelphia Water Department spokesman John DiGiulio said. DiGiulio said it could take days to make repairs as they will need to work with other utilities. Construction vehicles were already on the scene Tuesday morning cleaning up debris. The total amount of damage to the Midtown Village neighborhood could take weeks to determine. Water pressure was later restored to the entire area. Crews will continue to make repairs overnight into July 4th. Crews were pumping out flooded basements, and in some cases water had to be removed before electric crews were able to reach equipment to restore power, officials said. "Water and electricity don't mix, so we're working with the water department," Peco spokeswoman Deb Yemenijian said. "And in the cases where we can go in safely, we're working with customers to get power restored." Crews hope to reopen 13th Street by noon Wednesday.